The physical learning environment matters! At 21st Century Schools we have spent more than 25 years teaching about the relationship between the Physical Environment and student achievement. We began with describing how teachers could convert their traditional "box" classrooms with rows of students desk, etc., into a transformed environment that supported what we knew were best practices in curriculum and instruction. As lifelong learners we continually searched for information and ideas on designing the 21st century learning environment. This eventually led us to the design of "green" or "living" buildings, sustainable design, "green schoolyards". Then, eureka! an entire facility designed for the purpose of supporting 21st century learning! It was the most beautiful, incredible and authentic design of the learning environment we had ever seen. We were thrilled to discover Fielding Nair International, and have even teamed up with them to help schools create "the whole package" - curriculum and facilities - into a total 21st century school. Please feast your eyes and creative minds upon t_he excellent document below which provides an exciting, inspiring and informative introduction to an authentic, 21st century learning environment. It is a paradigm shift, but a wonderful one! 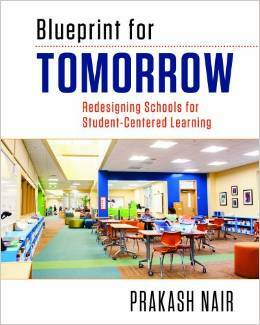 Also, we would like to announce that Prakash Nair's newest book, Blueprint for Tomorrow - Redesigning Schools for Student-Centered Learning is being released in October of 2014 by Harvard Educational Press. It is a must read for every educator, parent, business leader and community member. Warning: Almost all school architects claim to design "21st century schools". If their designs include the factory model "cells and bells", i.e., long hallways with rows of classrooms and lockers down each side, and a recommended daily schedule with students changing class once every 50 minutes - they are not 21st century. There is a widespread misconception that new buildings with lots of impressive technologies, even beautiful commons areas and lots of natural lighting mean "21st century". Those are some of the components, but if the paradigm of learning and teaching, curriculum and instruction, is still regimented and fragmented you do not have a 21st century school. Do not be deceived by the "21st century" trappings, which in reality amount to nothing more than a school designer's version of "the Emperor's New Clothes". Do not throw your precious funding into nothing more than a new building that is, in actuality, a continuation of the factory model paradigm. New buildings and computers do NOT a 21st century school make!